Remittances to Spanish-speaking Latin American countries overall have recovered from a decline during the recent recession, with the notable exception of Mexico, according to World Bank data analyzed by the Pew Research Center. 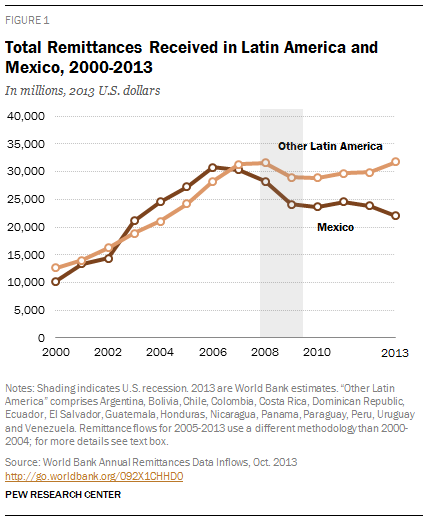 Migrants’ remittances to Mexico, an estimated $22 billion in 2013, are 29% below their 2006 peak. For all other Spanish-speaking Latin American nations overall, the 2013 estimate of $31.8 billion slightly surpasses the 2008 peak. Remittances from all sources to Spanish-speaking Latin American countries have more than doubled since 2000 but remain below their peak in 2007, the year in which the U.S. Great Recession began. The 2013 estimated total ($53.8 billion) is 13% below 2007’s $61.6 billion (in 2013 U.S. dollars). The United States is the most important source of money sent home by migrants to the 17 Latin American nations as a group (including Mexico) that are the focus of this report. U.S. remittances accounted for three-quarters of the total in 2012—$41 billion out of $52.9 billion, according to World Bank data. The decrease for Latin America overall was fueled by a falloff in remittances to Mexico, which receives more than 40% of all remittances to Latin America. If Mexico is excluded, remittance totals to Spanish-speaking Latin American countries as a whole have recovered after dropping during the U.S. recession years of 2007 to 2009. They bounced back in most of the other individual Spanish-speaking Latin American nations with remittances of more than $500 million a year. Of the dozen other nations, seven are estimated to have higher remittances in 2013 than during the U.S. recession years of 2007 to 2009. Remittances to Mexico peaked in 2006, a year earlier than the recent high point for Spanish-speaking Latin American nations as a whole. Aside from a single-year increase in 2011, they have fallen each year since then. Other countries in which 2013 estimated remittance flows have not recovered from declines during the U.S. recession years of 2007 to 2009 are Argentina, Colombia, Costa Rica, Dominican Republic and Ecuador. However, in seven other Spanish-speaking Latin American countries, remittances either have rebounded from declines during the recession years of 2007 to 2009 or did not fall markedly during those years. In Bolivia, El Salvador, Guatemala and Honduras, remittances are estimated to be higher in 2013 than at their peak before the recession. In Nicaragua, Paraguay and Peru, remittances did not decline and have continued to rise. The decline in remittances to Mexico—nearly all of which come from the U.S.—is linked to economic changes in the U.S., where one-in-ten Mexican-born people live (Passel, Cohn and Gonzalez-Barrera, 2012). The U.S. housing market crash hurt Mexican immigrants for whom the construction industry is a major job source, although a World Bank analysis concludes that the housing market’s link to remittance totals has weakened since 2011 (World Bank, 2013). Another factor in the fall of remittances to Mexico could be the decline in the Mexican immigrant population in the U.S. since the onset of the recession, due to decreased arrivals and increased departures, including deportations. A Pew Research Center analysis of government data found that recent migration from the U.S. to Mexico equals and possibly exceeds migration from Mexico to the U.S. through at least 2012 (Passel, Cohn and Gonzalez-Barrera, 2012). “Remittances” are funds or other assets sent to their home countries by migrants, either themselves or in the form of compensation for border, short-term and seasonal employees (World Bank, 2013). Most funds come directly from migrants; compensation accounts for a single-digit share of remittances in most Latin American nations (World Bank, 2011). Data in this report are provided by the World Bank and follow World Bank definitions adopted from the International Monetary Fund nations (World Bank, 2013). In some cases, trend analysis is restricted to nations with more than $500 million in annual remittances, where year-to-year trends are less volatile. The World Bank reports only remittances sent via formal channels, such as banks and other businesses that transfer money. If unofficial remittances were counted, the total could be as much as 50% higher or more, according to household surveys and other evidence cited by the World Bank (World Bank, 2005). In 2013, the World Bank revised its definition of remittances to delete a category of capital transfers between households. The World Bank also revised previously published numbers back to 2005 to reflect the change. This change had a particularly large impact on Brazil, reducing the total remittance amounts considerably. It had less impact on other Latin American nations (World Bank, 2013). The 2013 estimates and the 2005-2013 trend data in this report employ the new definition. The 2005 and 2012 data on size of flows from one country to another have not been updated by the World Bank to reflect the new definition, so those may differ somewhat from trend data. When reporting trends over time in remittance flows, amounts for years before 2013 are adjusted to 2013 dollars, using the average U.S. inflation rate for every preceding year. For this reason, some numbers in this report differ from unadjusted data published by the World Bank. Remittances from the U.S. to Spanish-speaking Latin American countries are concentrated in countries closest to the U.S. border. 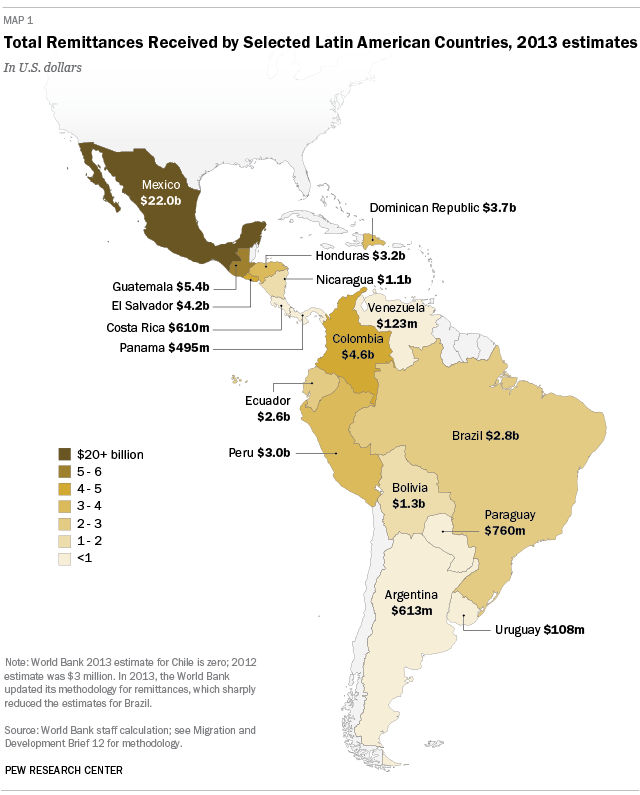 Mexico alone receives more than half—$23 billion in 2012. The share rises to four-fifths when three adjacent countries are added in: Guatemala ($4.4 billion), El Salvador ($3.6 billion) and Honduras ($2.6 billion). U.S. residents are the source of nearly all remittance money received in Mexico (98% in 2012) and of the majority of remittance money received in six other Spanish-speaking Latin American nations: Costa Rica, Dominican Republic, El Salvador, Guatemala, Honduras and Panama. Remittance amounts from the U.S. are higher than any other nation to three more countries, Colombia, Peru and Venezuela. Spain, the next-largest sending nation to Spanish-speaking Latin American countries, contributed 8% of 2012 remittances, or $4 billion. Canada, which ranked third, sent 1% of remittances to these countries, or $704 million in 2012. As is true of Latin America, the U.S. also is the largest source of remittances worldwide, sending a total of $123.3 billion in 2012, according to World Bank data. Saudi Arabia ($27.6 billion in 2012) is next, followed by Canada ($23.9 billion). Among all countries, the largest recipient of remittances is India, with an estimated $71 billion in 2013. China ranks second ($60.2 billion), followed by the Philippines ($26.1 billion). Mexico ranks fourth. Remittances are a larger source of money to Latin America than official foreign aid. In 2011, when foreign aid to Spanish-speaking Latin America nations totaled $6.2 billion, formal remittances were more than eight times that—$53.1 billion. Foreign aid totals less than remittances in each Spanish-speaking Latin American nation except Chile and Peru. Money sent home by migrants represents a varying share of the gross domestic product throughout Spanish-speaking Latin America. The highest shares are in three Central American nations, according to the World Bank: El Salvador (16.5% in 2012), Honduras (15.7%) and Guatemala (10.0%). What is the impact of remittances? On the macro level, the World Bank has included remittance inflows in its measure of creditworthiness since 2009, so nations with high levels of formal remittances may be allowed to borrow more money than they otherwise could. At the household level, as might be expected, those who receive remittances have higher incomes, spend more and are less likely to be extremely poor than those who do not receive remittances (Ratha, 2013). A significant part of remittances, often the majority, is spent on food, clothing and other day-to-day needs, according to research. Although there is variation by country, a significant, but smaller, share goes to saving and investment, especially among households that no longer include young children (Massey et al., 2012). Households that receive remittances also are more likely than those that do not to spend money on health care and education (Ratha, 2013). However, research is inconclusive about the impact of remittances on a receiving nation’s economy. Some studies have found that labor force participation declines in households that receive remittances, which hurts economic growth (Chami et al., 2003). Other studies focused on the impact of remittances in Mexico have found that at the state level remittances improve regional labor markets by raising employment levels (Orrenius et al., 2012). Remittance totals are strongly linked to the size of a particular country’s immigrant population in the U.S. and the share of its emigrants who live in the U.S. For example, the four Latin American nations that get the highest share of their remittances from the U.S.—Mexico, El Salvador, Guatemala and Honduras—also are the top four in terms of the share of their emigrants who live in the U.S. The Latin American nations with the lowest share of remittances from the U.S.—Uruguay, Bolivia and Paraguay—also have the lowest share of emigrants living in the U.S. Most immigrants do send remittances home, and so do some people born in the U.S.; a Pew Research Center survey in 2008 found that 54% of foreign-born Hispanics and 17% of U.S.-born Hispanics say they send money to their home country (Lopez, Livingston and Kochhar, 2009). Some research has found that foreign-born U.S. citizens and legal permanent residents are less likely to send remittances than unauthorized immigrants who may have less attachment to the U.S. and more to their home country (Massey et al., 2012). This report is based mainly on data on remittances compiled by the World Bank, including overall trends for 2000 to 2013 as well as country-to-country flows for 2012. To add context to the remittance findings, the report also uses World Bank data on foreign aid and GNP, as well as 2012 estimates from the U.S. Census Bureau’s American Community Survey on the immigrant population in the U.S. from selected Latin American nations. This report examines official flows of remittances, including overall trends from 2000 to 2013 as well as contributions from the U.S. in 2005 and 2012, with a particular focus on 17 Spanish-speaking nations in Latin America: Argentina, Bolivia, Chile, Colombia, Costa Rica, Dominican Republic, Ecuador, El Salvador, Guatemala, Honduras, Mexico, Nicaragua, Panama, Paraguay, Peru, Uruguay and Venezuela. Data also are included separately about Brazil. The data in this report, both for remittances and other economic indicators, are derived from the World Bank. Data on immigrant populations in the U.S. come from the U.S. Census Bureau’s American Community Survey. This report was written by D’Vera Cohn, Ana Gonzalez-Barrera and Danielle Cuddington. The authors thank Mark Hugo Lopez, Jon Cohen, Rakesh Kochhar, Jeffrey Passel and Paul Taylor for editorial guidance and data analysis and Dilip Ratha for supplying 2005 data about U.S. remittances to Latin America. Anna Brown number-checked the report. Marcia Kramer was the copy editor. Find related reports from the Pew Research Center’s Hispanic Trends Project online at pewresearch.org/hispanic. Unless otherwise specified, references to Latin America comprise the following Spanish-speaking countries: Argentina, Bolivia, Chile, Colombia, Costa Rica, Dominican Republic, Ecuador, El Salvador, Guatemala, Honduras, Mexico, Nicaragua, Panama, Paraguay, Peru, Uruguay and Venezuela. Cuba is not included because of lack of available data. Totals for Brazil are included separately. “Remittances” include money sent via formal channels by migrants themselves, as well as compensation of employees working in other countries. Compensation generally accounts for a small fraction of the total. See text box on page 6 for more detail. “Adults” refer to those ages 18 and older.